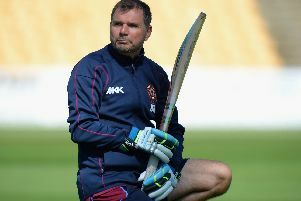 Ton-up batsman Ben Duckett admits Wednesday’s third day of their Specsavers County Championship clash against Glamorgan at Cardiff is ‘massive’ for Northants. The England man will start the day at Sophia Gardens on 111 not out, with partner Luke Procter unbeaten on 50, and Northants in a great position at 169 without loss, a lead of 196 over their hosts. Tuesday’s second day proved to be a very good one for Northants, and for Duckett, as they first bowled out Glamorgan for 254 to seal a 27-run first innings lead, and they then rammed home their advantage with the bat. Something they have failed to do on many occasions this season. But Duckett knows the County still have a lot of very hard work to do against their fellow strugglers, and knows they cannot let their grip on this game loosen. “Tomorrow is massive,” said Duckett, who hit his 14th century for Northants, and his first this season. “In the past, we’ve been on the opposite end of days like this where sides have really hammered us, and I think it’s really important for us to do the same in the morning. Duckett grabbed the headlines, but he also praised the efforts of the County’s bowling attack that earned that first innings lead, calling their performance ‘perfect’ with Ben Sanderson and Nathan Buck taking three wickets each, and Luke Procter and Brett Hutton two apiece. “Any lead on that wicket was good for us, especially from where they were,” said Duckett, referring to Glamorgan at one point being 156 for three, with Australian Test batsman Usman Khawaja on his way to scoring 103. “Take away Khawaja’s innings, and he played very well, other than that I thought we stuck really hard at it.